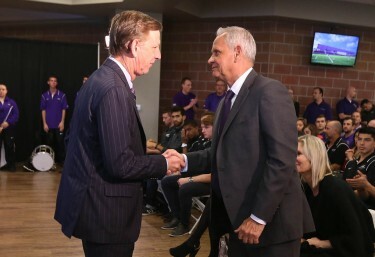 Mike Vaught, Grand Canyon University’s vice president of athletics, called an old friend last month and asked whether he’d be interested in becoming the University’s new men’s soccer coach or, if not, whether he could recommend someone. Vaught had only one candidate on his list — the man he was calling, Schellas Hyndman. “We’re good enough friends that I knew he’d listen,” Vaught said. 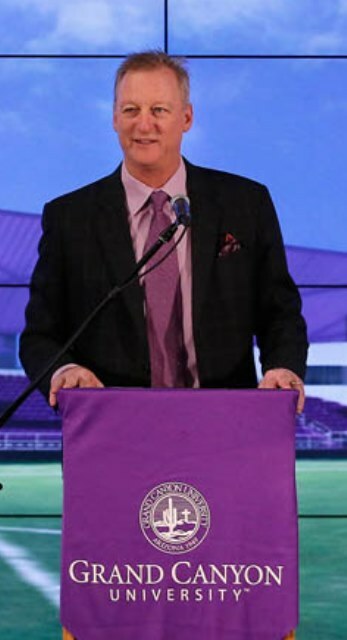 Schellas Hyndman addresses the press conference Tuesday announcing his hiring as GCU men’s soccer coach. On Tuesday, Hyndman was introduced as GCU’s coach during a packed press conference in the Student Union that included the announcement that the University will open a new campus stadium in the fall and make soccer the centerpiece of its fall sports offerings. President/CEO Brian Mueller (left) welcomes Hyndman to GCU. Two freshmen on the GCU team this season, Alexander Ramirez and Niki Jackson, noticed that aura when they and their teammates met with Hyndman on Tuesday. “This is really good for us,” Jackson said. Not only is the 65-year-old Hyndman a coach through and through — “When the day comes that I’m done coaching, I’m done with soccer,” he said — he also is a man with a fascinating background and a history of overcoming adversity. He spent his first eight years in China and quickly learned that being a blond, blue-eyed child of Portuguese and Russian descent wasn’t going to make him a frontrunner in any popularity contests there. So he learned martial arts, and today he’s a 10th-degree black belt and looks more fit than people half his age. “He’s my bodyguard,” Vaught joked. While Hyndman enjoyed being part of MLS, he’s looking forward to getting back in the college game. 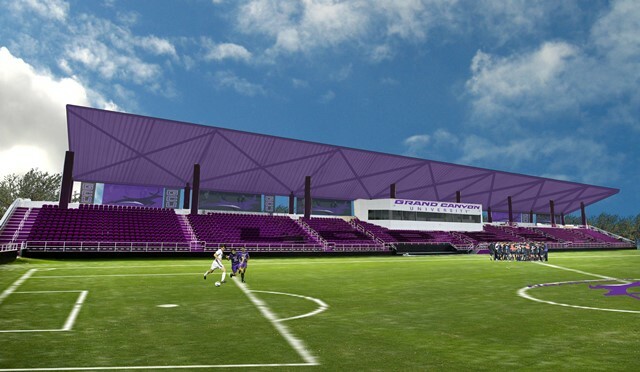 Hyndman aims to build on that enthusiasm with the help of the new stadium, to be installed just east of Antelope Gym on what is now an artificial-turf field for intramurals. It will be natural grass and will have 2,800 shaded seats in addition to 10-foot berms on three sides, bringing the capacity to 6,000. The stadium also will be used for lacrosse, rugby, concerts and other events. Intramurals will be relocated to two fields in The Grove, the new configuration of four six-story residence halls being built on the northwest corner of campus. 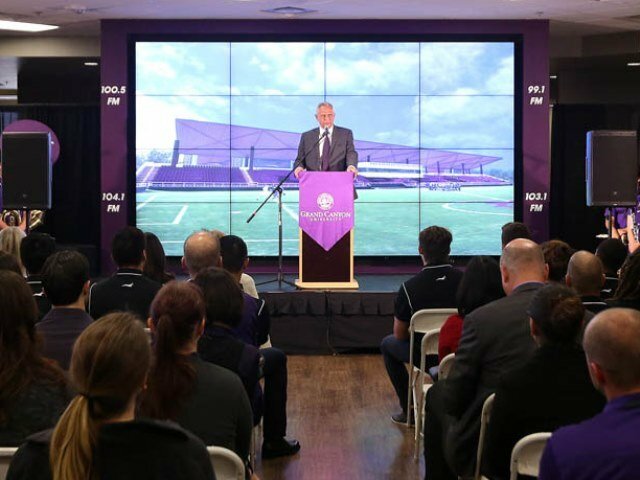 Making soccer a tailgate-worthy destination is a natural for GCU, which doesn’t have a football team and is primed to warm up for basketball season by embracing a fall sport in a similar manner. The local community is a key part of the equation, considering that soccer is the most popular sport in west Phoenix in addition to being the fastest growing sport in Arizona and the most popular sport in the world. Mueller envisions having the University get involved in youth programs while it seeks to grow its national profile. “It’s a community-building sport,” he said. Hyndman’s arrival is Vaught’s third major hire in a little more than two months on the job, following a deputy director of athletics (Jamie Boggs) and an assistant athletics director (Renee Gonzalez). Now comes Hyndman, whom Mueller called “the Mike Krzyzewski of soccer,” a reference to the winningest basketball coach in history. “We shoot for superstars,” Vaught said.